Bugs get a generally bad rap in sci-fi. Heinlein declared all-out war on them, in the vanguard of a general pop sci-fi trope that, if something comes out of a flying saucer and it's got compound eyes, you can safely shoot it without worrying about moral repercussions. Even Star Trek, generally to the fore of interplanetary political correctness, cast the bugs (and the almost equally-maligned reptiles) as the villains of the multi-species Xindi council. Mind you, that was Enterprise, so it's not like anyone was paying attention. Makuta Gorast is known throughout the universe for her raw power and violent rage. With four claw arms, Mask of Disruption and Nynrah ghost blaster, even other Makuta have reason to fear her might. 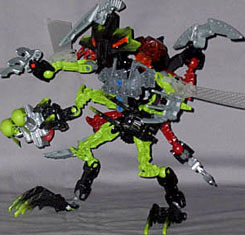 Besides being a bundle of nerves, she's also notable - along with Toa Gali - for making Mistika the first Bionicle series to feature two women, though let's be honest, it doesn't count for much even by androgynous biomechanoid standards; she'd probably have been a guy had someone at Lego not remembered that it's only female mosquitos that feed on blood. [regardless, that's more thought than Mattel put into it --ed.] Still, what she lacks in looks, she makes up in icky bugness. 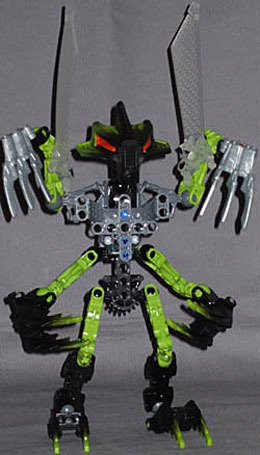 Like all the swamp Makuta involved in the Mistika battle, Gorast doesn't entirely follow the standard Bionicle body plan: her torso is constructed to add two extra limbs, and all four of the resulting arms and Matoran-style single pieces, rather than the separate upper and lower arms of your standard figures. Her legs are Matoran-style as well, with an obvious (molded and immobile) knee, but they've got a separate lower leg beneath the Matoran piece, giving her a welcome mobility boost. And the head's on the end of a double-balljoint neck - it's weird all over. The final articulation tally is the two balljoints at either end of the neck, balljoint shoulders and wrists (all four), hips, knees or whatever, ankles, and swivels where the wings attach to the upper set of arms. The wings are a bit of a hindrance - they look good on their own, translucent with a nice layered hex pattern, but they're not in an especially useful position on the body, and it can be difficult to position them plausibly. An alternative is to attach them behind the shoulders (the upper ones), which can be done using just the parts available, or if you have extras, build balljoint mounts for them. The claws are also a bit tricky to get looking good - although all four wrists are proper balljoints, mobile in three axes, they still have some limitations due to the necessary housings, and for some reason the lower claws are mounted sideways so they often seem to run up against the edge of their joints' range. The upper ones are easier to position, but moving their arms moves the wings, which brings you back to step one. On the plus side, Gorast has a good colour balance, with sombre grey and black offset by creepy swamp green, and that's carried through onto the custom pieces, the lower claws and mask. The airbrushing of green onto the mask is especially good, since the side ridges have more of that hex pattern moulded into them, and the green catches the raised hexes. Otherwise the mask has a very thin lower face beneath wide-set slit eyes - very bug-like - and a soft rubber proboscis. Like the other swamp bugs in Mistika, there's no real head beneath the mask, just the pair of eyes and the balljoint mount for the neck. 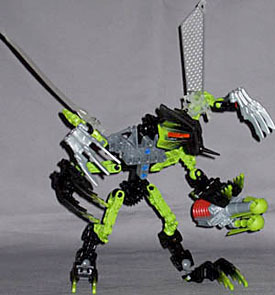 Besides her claws and general creepiness, Gorast is armed with the standard green-and-red Makuta Nynrah weapon - it's unmodified, with no extra bits attached, and fits neatly in behind the claws on either of the lower arms. As usual two darts are supplied - one for the launcher tube itself, the spare going in the open Technic port opposite the mounting point until needed. One good squeeze of the pump and the dart goes flying quite nicely. She's unusual among the Makuta in that her connection point for her Matoran buddy is the Toa-style piggyback one, rather than the right-angled "ride me like a pony" sort the bad guys normally use. Gorast's buddy is Radiak, the one with knives on all four limbs - putting them together isn't that bad structurally, since she's already got extra limbs and adding four more blade-tipped ones makes her look really nasty, but in colour terms it's not so good, with Radiak's dark red a poor match for Gorast's green. I like the idea of Gorast - especially the creepy mosquito mask - but the limitation of the basic Bionicle parts allocation hampers her, in requiring that to have six limbs, they have to be simpler than usual. 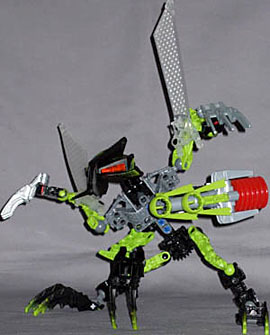 Replace the Matoran arms with articulated limbs from other sets and you've got a winner here.